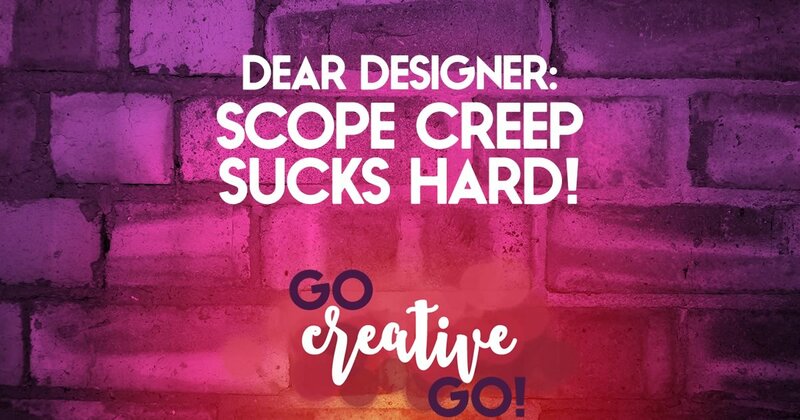 Dear Designer: Are You A Scope Creep Sucker? Have you ever found yourself in the middle of a design project that seems to go on AND on, with no real milestones met and deadlines constantly extended? Have you ever found yourself in a revising loop, tweaking and altering the tiniest details over and over again before you get the seal of approval from a client? If you answered either of those questions with an affirmative nod of your head, you’ve dealt with some level of scope creep. “Scope creep (also called requirement creep, function creep and feature creep) in project management refers to uncontrolled changes or continuous growth in a project’s scope. This can occur when the scope of a project is not properly defined, documented, or controlled. It is generally considered harmful. When scope creep begins its advance, it is often subtle, something you can easily choose to ignore. Your client asks if you can add a little extra functionality to their website, or asks you to throw in a quick letterhead design to go along with their new logo. It won’t take much time and it will add a little extra something significant to your portfolio or case study right? It’s right and it’s wrong. And here’s why. While any design project is a collaboration with your client, when it comes to meeting your design brief and project deadline you’re the foreman, the manager, the boss on board. And if you allow yourself to be manipulated into tacking on additional work, you run the risk of losing your position of authority and becoming a do-boy or girl. Eventually, unchecked, scope creep can derail design projects and erodes your standing as the expert in charge. You don’t want your client pulling your strings like you’re a marionette, do you? But, It’s Just A Little Change! Sure, the little extra something the client wants might not seem like a big deal. It won’t take long. It’s well within your skill-set and area of expertise. But, was it factored into the scope of the project, the design brief, the contract your delivered and your client signed? But when you say yes to that one little change, without mentioning that it actually changes and broadens the scope of the project, you let the client know you’re not going to stand firm on the design brief upon with you both agreed. So it becomes all the easier for your client to request further tweaks, revisions and redesigns. Any of which can delay the project and decrease your bottom line. Why Are You Charging Me For These Changes? If you allow scope creep to enter into your agreement, it’s going to be all the harder to request additional fees when you finally realize you can’t continue to work for free. If you’ve made five revisions, even though the contract stipulated you’d only make three, your client isn’t going to understand why you’re trying to charge for the sixth. Stand Your Ground & Keep Clients Happy? It can be done. A signed contract or a delivered design brief don’t mean you can’t compromise. Scope creep isn’t a foregone conclusion. The key is to keep detailed records of each revision, each change request and each compromise. Be detailed and thorough. Let them know when you’ve padded the agreement in their favor. You don’t have to be supercilious or smarmy about it, just make sure it’s documented and understood. I don’t think the majority of design clients are out to get you, let me make that clear. That being said, it’s no one’s fault but your own if you don’t set standards for how and when the work will get done, how and when you’ll make revisions, and the proper procedure for any additions. Otherwise you just might find yourself strung up like a sucker. Remember, either you control the project or the project will control you. http://www.gocreativego.com/wp-content/uploads/2015/10/GCG-pinnable-scope-creep.jpg 1080 735 Mallie Hart http://www.gocreativego.com/wp-content/uploads/2016/07/GCG-sitelogo-new.png Mallie Hart2015-10-07 09:02:132016-09-20 18:18:22Dear Designer: Are You A Scope Creep Sucker? This is great – I really have to watch this too! I think it’s something that almost all creatives face on a regular basis, Cara. We can all stand to take a stand against scope creep! Excellent post! I tend to be too nice and it never works well for me in the end. I think you can be nice AND firm at the same time, Gwen. You’re absolutely right. It’s about setting, and maintaining, boundaries. I think the balance of control has to be more equal. 2:1 for the client doesn’t work for me, especially if the client starts to get heavy with that imbalance. Yes, I’m getting paid, so, YES, the client has plenty of rights, and should fell comfortable voicing them. But that’s the beauty of our business, there’s no single correct way to go about it. I would never offer up those three qualities, and my clients would never expect me to do so. But it works for many designers and their clients. So appreciate you chiming in, Sean. Great article! Scope creep can be a huge killer. Something that we’ve found that works really well for our industry, web design and development, is to initially build a very thorough scope, then for every change to that scope, we document it and make the client sign off on it. If it is a large item, we make sure to send along a quote for the change as well. The biggest issue we ran into when figuring all this out was how to manage the changes and documentation and which tools to use. Nowadays we use a mixture of JIRA for our project management, Confluence for our document management, BrainLeaf for our scope development & approval management, and Freshbooks for our invoicing. This system took a while to stitch together, but now that we have it, life is SO much easier. The right tools put together in the right ways can make a huge difference. Thanks again, and have a good day! Thanks, Jason! I’ll take a look at the tools you’ve mentioned. I also use a variety of tools to keep projects on track, as there simply isn’t a one-size-fits-all tool that can manage scope creep on the variety of branding, visual marketing and web design/development projects we work on. Definitely will stop by your site later to see what you’re working on, too!